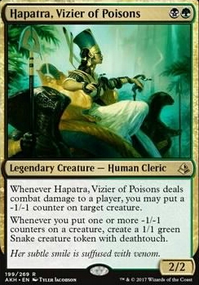 If there is an ability on your field increasing the power of creatures you control, is a new creature entering the battlefield considered to have the increased power upon entry, or does the effect apply after the card enters? 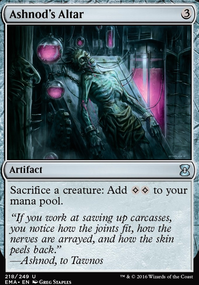 Do power/toughness boosts affect creatures in the graveyard? Thanks! Beastmaster Ascension is already on the list! 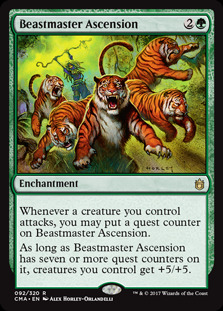 Beastmaster Ascension - +5/+5 that is super easy to activate with an aggressive deck. Descendants' Path - Cheats creatures into play, and you don't loose out on your draw if it doesn't happen to be a creature. 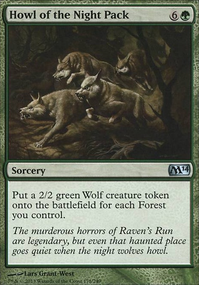 If you're running heavy tribal it usually hits gold more often than not. Heirloom Blade - Much like Descendants' Path but with death effects. It can really help you recover after a wrath, or make an opponent think twice about removing one of your threats. Call to the Kindred - More digging out of your warriors. Cryptic Gateway - Lets you cheat your tribal creatures into play. Shared Animosity - Usually a nice big power boost to all your warriors when they attack. If Najeela, the Blade-Blossom 's ability has been used, they get trample, lifelink, and haste to go with their new power boost. A suggestion for making your squirrels big in a jam, Mirror Entity . 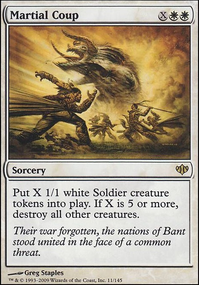 Other ideas: Beastmaster Ascension , Tribal Unity , Triumph of the Hordes , classic Overrun , maybe Kamahl, Fist of Krosa ? Other pumps if interested: Craterhoof Behemoth , Pathbreaker Ibex , Decimator of the Provinces , Siege Behemoth , Day of the Dragons could be super interesting as well. 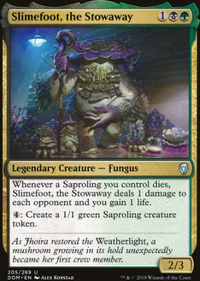 I would say stuff like Overrun and Dragons are probably the weakest here strictly going by the triple of one color needed to cast in a three color deck. You could even run something like Nemesis Mask to try and swing through for damage as well. If you’re looking to go tall, maybe Alpha Status or Berserk for funsies. And finally, if you’re looking for a quick little enchantment combo... you could run Ajani's Chosen + Enchanted Evening for infinite tokens. So for upgrades Wedge recommended Devoted Druid , Parallel Lives , Cauldron of Souls , Black Sun's Zenith , Skullclamp , Beastmaster Ascension , Seshiro the Anointed , Blood Artist , and Triumph of the Hordes . I have most of these cards, but I don't know what to take out. 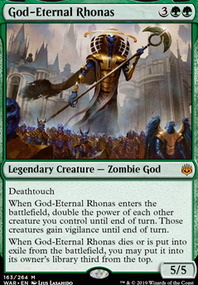 I have Parallel Lives , Black Sun's Zenith , and Triumph of the Hordes on hand right now, so those are the ones I would like to substitute for other cards.